The stock of a business is divided into shares, the total of which must be stated at the time of business formation. Given the total amount of money invested in the business, a share has a certain declared face value, commonly known as the par value of a share. The par value is the de minimis (minimum) amount of money that a business may issue and sell shares for in many jurisdictions and it is the value represented as capital in the accounting of the business. In other jurisdictions, however, shares may not have an associated par value at all. Such stock is often called non-par stock. Shares represent a fraction of ownership in a business. A business may declare different types (classes) of shares, each having distinctive ownership rules, privileges, or share values. Ownership of shares is documented by issuance of a stock certificate. A stock certificate is a legal document that specifies the amount of shares owned by the shareholder, and other specifics of the shares, such as the par value, if any, or the class of the shares. Used in the plural, stocks is often used as a synonym for shares. Traditionalist demands for the plural stocks to be used only when referring to stocks of more than one company are rarely heard nowadays. In the United Kingdom, South Africa, and Australia, stock can also refer to completely different financial instruments such as government bonds or, less commonly, to all kinds of marketable securities. New equity issues may have specific legal clauses attached that differentiate them from previous issues of the issuer. Some shares of common stock may be issued without the typical voting rights, for instance, or some shares may have special rights unique to them and issued only to certain parties. Often, new issues that have not been registered with a securities governing body may be restricted from resale for certain periods of time. Preferred stock may be hybrid by having the qualities of bonds of fixed returns and common stock voting rights. They also have preference in the payment of dividends over common stock and also have been given preference at the time of liquidation over common stock. They have other features of accumulation in dividend. For more details on this topic, see equity derivative. A stock derivative is any financial instrument which has a value that is dependent on the price of the underlying stock. Futures and options are the main types of derivatives on stocks. The underlying security may be a stock index or an individual firm's stock, e.g. single-stock futures. Stock futures are contracts where the buyer is long, i.e., takes on the obligation to buy on the contract maturity date, and the seller is short, i.e., takes on the obligation to sell. Stock index futures are generally not delivered in the usual manner, but by cash settlement. A stock option is a class of option. Specifically, a call option is the right (not obligation) to buy stock in the future at a fixed price and a put option is the right (not obligation) to sell stock in the future at a fixed price. Thus, the value of a stock option changes in reaction to the underlying stock of which it is a derivative. The most popular method of valuing stock options is the Black Scholes model. Apart from call options granted to employees, most stock options are transferable. One of the earliest stock by VOC. During Roman times, the empire contracted out many of its services to private groups called publicani. Shares in publicani were called "socii" (for large cooperatives) and "particulae" which were analogous to today's Over-The-Counter shares of small companies. Though the records available for this time are incomplete, Edward Chancellor states in his book Devil Take the Hindmost that there is some evidence that a speculation in these shares became increasingly widespread and that perhaps the first ever speculative bubble in "stocks" occurred. The first company to issue shares of stock after the Middle Ages was the Dutch East India Company in 1606. The innovation of joint ownership made a great deal of Europe's economic growth possible following the Middle Ages. The technique of pooling capital to finance the building of ships, for example, made the Netherlands a maritime superpower. Before adoption of the joint-stock corporation, an expensive venture such as the building of a merchant ship could be undertaken only by governments or by very wealthy individuals or families. 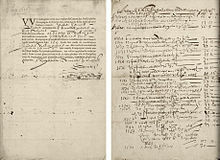 Economic historians find the Dutch stock market of the 17th century particularly interesting: there is clear documentation of the use of stock futures, stock options, short selling, the use of credit to purchase shares, a speculative bubble that crashed in 1695, and a change in fashion that unfolded and reverted in time with the market (in this case it was headdresses instead of hemlines). Dr. Edward Stringham also noted that the uses of practices such as short selling continued to occur during this time despite the government passing laws against it. This is unusual because it shows individual parties fulfilling contracts that were not legally enforceable and where the parties involved could incur a loss. Stringham argues that this shows that contracts can be created and enforced without state sanction or, in this case, in spite of laws to the contrary. 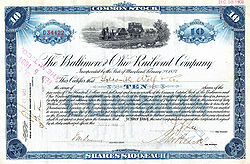 Stock certificate for ten shares of the Baltimore and Ohio Railroad Company. A shareholder (or stockholder) is an individual or company (including a corporation) that legally owns one or more shares of stock in a joint stock company. Both private and public traded companies have shareholders. Companies listed at the stock market are expected to strive to enhance shareholder value. Shareholders are granted special privileges depending on the class of stock, including the right to vote on matters such as elections to the board of directors, the right to share in distributions of the company's income, the right to purchase new shares issued by the company, and the right to a company's assets during a liquidation of the company. However, shareholder's rights to a company's assets are subordinate to the rights of the company's creditors. Shareholders are considered by some to be a partial subset of stakeholders, which may include anyone who has a direct or indirect equity interest in the business entity or someone with even a non-pecuniary interest in a non-profit organization. Thus it might be common to call volunteer contributors to an association stakeholders, even though they are not shareholders. Although directors and officers of a company are bound by fiduciary duties to act in the best interest of the shareholders, the shareholders themselves normally do not have such duties towards each other. However, in a few unusual cases, some courts have been willing to imply such a duty between shareholders. For example, in California, USA, majority shareholders of closely held corporations have a duty to not destroy the value of the shares held by minority shareholders. The largest shareholders (in terms of percentages of companies owned) are often mutual funds, and, especially, passively managed exchange-traded funds. The owners of a company may want additional capital to invest in new projects within the company. They may also simply wish to reduce their holding, freeing up capital for their own private use. By selling shares they can sell part or all of the company to many part-owners. The purchase of one share entitles the owner of that share to literally share in the ownership of the company, a fraction of the decision-making power, and potentially a fraction of the profits, which the company may issue as dividends. In the common case of a publicly traded corporation, where there may be thousands of shareholders, it is impractical to have all of them making the daily decisions required to run a company. Thus, the shareholders will use their shares as votes in the election of members of the board of directors of the company. In a typical case, each share constitutes one vote. Corporations may, however, issue different classes of shares, which may have different voting rights. Owning the majority of the shares allows other shareholders to be out-voted - effective control rests with the majority shareholder (or shareholders acting in concert). In this way the original owners of the company often still have control of the company. Although ownership of 50% of shares does result in 50% ownership of a company, it does not give the shareholder the right to use a company's building, equipment, materials, or other property. This is because the company is considered a legal person, thus it owns all its assets itself. This is important in areas such as insurance, which must be in the name of the company and not the main shareholder. ...it can safely be stated that there does not exist any publicly traded company where management works exclusively in the best interests of OPMI [Outside Passive Minority Investor] stockholders. Instead, there are both "communities of interest" and "conflicts of interest" between stockholders (principal) and management (agent). This conflict is referred to as the principal/agent problem. It would be naive to think that any management would forgo management compensation, and management entrenchment, just because some of these management privileges might be perceived as giving rise to a conflict of interest with OPMIs. Even though the board of directors runs the company, the shareholder has some impact on the company's policy, as the shareholders elect the board of directors. Each shareholder typically has a percentage of votes equal to the percentage of shares he or she owns. So as long as the shareholders agree that the management (agent) are performing poorly they can elect a new board of directors which can then hire a new management team. In practice, however, genuinely contested board elections are rare. Board candidates are usually nominated by insiders or by the board of the directors themselves, and a considerable amount of stock is held or voted by insiders. Owning shares does not mean responsibility for liabilities. If a company goes broke and has to default on loans, the shareholders are not liable in any way. However, all money obtained by converting assets into cash will be used to repay loans and other debts first, so that shareholders cannot receive any money unless and until creditors have been paid (often the shareholders end up with nothing). Financing a company through the sale of stock in a company is known as equity financing. Alternatively, debt financing (for example issuing bonds) can be done to avoid giving up shares of ownership of the company. Unofficial financing known as trade financing usually provides the major part of a company's working capital (day-to-day operational needs). The shares of a company may in general be transferred from shareholders to other parties by sale or other mechanisms, unless prohibited. Most jurisdictions have established laws and regulations governing such transfers, particularly if the issuer is a publicly-traded entity. The desire of stockholders to trade their shares has led to the establishment of stock exchanges. A stock exchange is an organization that provides a marketplace for trading shares and other derivatives and financial products. Today, investors are usually represented by a stock broker who buys and sells shares of a wide range of companies on the exchanges. A company may list its shares on an exchange by meeting and maintaining the listing requirements of a particular stock exchange. In the United States, through the inter-market quotation system, stocks listed on one exchange can also be traded on other participating exchanges, including the Electronic Communication Networks (ECNs), such as Archipelago or Instinet. Many large non-U.S companies choose to list on a U.S. exchange as well as an exchange in their home country in order to broaden their investor base. These companies must maintain a block of shares at a bank in the US, typically a certain percentage of their capital. On this basis, the holding bank establishes American Depositary Shares and issues an American Depository Receipt (ADR) for each share a trader acquires. Likewise, many large U.S. companies list their shares at foreign exchanges to raise capital abroad. Small companies that do not qualify and cannot meet the listing requirements of the major exchanges may be traded over the counter (OTC) by an off-exchange mechanism in which trading occurs directly between parties. The major OTC markets in the United States are the electronic quotation systems OTC Bulletin Board (OTCBB) and the Pink OTC Markets (Pink Sheets) where individual retail investors are also represented by a brokerage firm and the quotation service's requirements for a company to be listed are minimal. Shares of companies in bankruptcy proceeding are usually listed by these quotation services after the stock is delisted from an exchange. There are various methods of buying and financing stocks. The most common means is through a stock broker. Whether they are a full service or discount broker, they arrange the transfer of stock from a seller to a buyer. Most trades are actually done through brokers listed with a stock exchange. There are many different stock brokers from which to choose, such as full service brokers or discount brokers. The full service brokers usually charge more per trade, but give investment advice or more personal service; the discount brokers offer little or no investment advice but charge less for trades. Another type of broker would be a bank or credit union that may have a deal set up with either a full service or discount broker. There are other ways of buying stock besides through a broker. One way is directly from the company itself. If at least one share is owned, most companies will allow the purchase of shares directly from the company through their investor relations departments. However, the initial share of stock in the company will have to be obtained through a regular stock broker. Another way to buy stock in companies is through Direct Public Offerings which are usually sold by the company itself. A direct public offering is an initial public offering in which the stock is purchased directly from the company, usually without the aid of brokers. When it comes to financing a purchase of stocks there are two ways: purchasing stock with money that is currently in the buyer's ownership, or by buying stock on margin. Buying stock on margin means buying stock with money borrowed against the stocks in the same account. These stocks, or collateral, guarantee that the buyer can repay the loan; otherwise, the stockbroker has the right to sell the stock (collateral) to repay the borrowed money. He can sell if the share price drops below the margin requirement, at least 50% of the value of the stocks in the account. Buying on margin works the same way as borrowing money to buy a car or a house, using a car or house as collateral. Moreover, borrowing is not free; the broker usually charges 8-10% interest. Selling stock is procedurally similar to buying stock. Generally, the investor wants to buy low and sell high, if not in that order (short selling); although a number of reasons may induce an investor to sell at a loss, e.g., to avoid further loss. As with buying a stock, there is a transaction fee for the broker's efforts in arranging the transfer of stock from a seller to a buyer. This fee can be high or low depending on which type of brokerage, full service or discount, handles the transaction. After the transaction has been made, the seller is then entitled to all of the money. An important part of selling is keeping track of the earnings. Importantly, on selling the stock, in jurisdictions that have them, capital gains taxes will have to be paid on the additional proceeds, if any, that are in excess of the cost basis. The price of a stock fluctuates fundamentally due to the theory of supply and demand. Like all commodities in the market, the price of a stock is sensitive to demand. However, there are many factors that influence the demand for a particular stock. The field of fundamental analysis and technical analysis attempt to understand market conditions that lead to price changes, or even predict future price levels. A recent study shows that customer satisfaction, as measured by the American Customer Satisfaction Index (ACSI), is significantly correlated to the market value of a stock. Stock price may be influenced by analyst's business forecast for the company and outlooks for the company's general market segment. At any given moment, an equity's price is strictly a result of supply and demand. The supply is the number of shares offered for sale at any one moment. The demand is the number of shares investors wish to buy at exactly that same time. The price of the stock moves in order to achieve and maintain equilibrium. When prospective buyers outnumber sellers, the price rises. Eventually, sellers attracted to the high selling price enter the market and/or buyers leave, achieving equilibrium between buyers and sellers. When sellers outnumber buyers, the price falls. Eventually buyers enter and/or sellers leave, again achieving equilibrium. Thus, the value of a share of a company at any given moment is determined by all investors voting with their money. If more investors want a stock and are willing to pay more, the price will go up. If more investors are selling a stock and there aren't enough buyers, the price will go down. Note: "For Nasdaq-listed stocks, the price quote includes information on the bid and ask prices for the stock." Of course, that does not explain how people decide the maximum price at which they are willing to buy or the minimum at which they are willing to sell. In professional investment circles the efficient market hypothesis (EMH) continues to be popular, although this theory is widely discredited in academic and professional circles. Briefly, EMH says that investing is overall (weighted by a Stdev) rational; that the price of a stock at any given moment represents a rational evaluation of the known information that might bear on the future value of the company; and that share prices of equities are priced efficiently, which is to say that they represent accurately the expected value of the stock, as best it can be known at a given moment. In other words, prices are the result of discounting expected future cash flows. The EMH model, if true, has at least two interesting consequences. First, because financial risk is presumed to require at least a small premium on expected value, the return on equity can be expected to be slightly greater than that available from non-equity investments: if not, the same rational calculations would lead equity investors to shift to these safer non-equity investments that could be expected to give the same or better return at lower risk. Second, because the price of a share at every given moment is an "efficient" reflection of expected value, then—relative to the curve of expected return—prices will tend to follow a random walk, determined by the emergence of information (randomly) over time. Professional equity investors therefore immerse themselves in the flow of fundamental information, seeking to gain an advantage over their competitors (mainly other professional investors) by more intelligently interpreting the emerging flow of information (news). The EMH model does not seem to give a complete description of the process of equity price determination. For example, stock markets are more volatile than EMH would imply. In recent years it has come to be accepted that the share markets are not perfectly efficient, perhaps especially in emerging markets or other markets that are not dominated by well-informed professional investors. Another theory of share price determination comes from the field of Behavioral Finance. According to Behavioral Finance, humans often make irrational decisions—particularly, related to the buying and selling of securities—based upon fears and misperceptions of outcomes. The irrational trading of securities can often create securities prices which vary from rational, fundamental price valuations. For instance, during the technology bubble of the late 1990s (which was followed by the dot-com bust of 2000-2002), technology companies were often bid beyond any rational fundamental value because of what is commonly known as the "greater fool theory". The "greater fool theory" holds that, because the predominant method of realizing returns in equity is from the sale to another investor, one should select securities that they believe that someone else will value at a higher level at some point in the future, without regard to the basis for that other party's willingness to pay a higher price. Thus, even a rational investor may bank on others' irrationality. When companies raise capital by offering stock on more than one exchange, the potential exists for discrepancies in the valuation of shares on different exchanges. A keen investor with access to information about such discrepancies may invest in expectation of their eventual convergence, known as arbitrage trading. Electronic trading has resulted in extensive price transparency (efficient market hypothesis) and these discrepancies, if they exist, are short-lived and quickly equilibrate. ^ "Compact Oxford English Dictionary". Askoxford.com. http://www.askoxford.com/concise_oed/stock?view=uk. Retrieved 2010-02-12. ^ "Cambridge Advanced Learner's Dictionary". Dictionary.cambridge.org. http://dictionary.cambridge.org/define.asp?key=78290&dict=CALD. Retrieved 2010-02-12. ^ "Stock Basics", Investor Guide.com. ^ Zvi Bodie, Alex Kane, Alan J. Marcus, Investments, 7th Ed., p. 26–53. ^ "Black Scholes Calculator". Tradingtoday.com. http://www.tradingtoday.com/black-scholes. Retrieved 2010-02-12. ^ "?". http://www.sjsu.edu/depts/economics/faculty/stringham/docs/stringham-amsterdam.pdf. Retrieved 16 August 2010. ^ "Devil the Hindmost" by Edward Chancellor. ^ "Jones v. H.F. Ahmanson & Co. (1969) 1 C3d 93". Online.ceb.com. http://online.ceb.com/calcases/C3/1C3d93.htm. Retrieved 2010-02-12. ^ Jackson, Thomas (2001). The Logic and Limits of Bankruptcy Law. Oxford Oxfordshire: Oxford University Press. p. 32. ISBN 1587981149. ^ "Increased Customer Satisfaction Increases Stock Price". http://www.rhsmith.umd.edu/research/ras/spring2006/2.html. ^ "Understanding Stock Prices: Bid, Ask, Spread". Youngmoney.com. http://www.youngmoney.com/investing/sharebuilder/goals/031021_08. Retrieved 2010-02-12. This page was last modified on 31 March 2011 at 09:24.